The Last Glassholes Are Still on RedditBut please, please, don’t call them Glassholes. AR Gaming Is a Work in Progress — But There Are Still Some Good GamesThe best of the best. The Past and Future of the Head-up Display, the Original Augmented RealityHow the head-up display moved from fighter jets to minivans. Want to Try Augmented Reality? This Is the Hardware You’ll NeedWhile phones are perfectly suitable AR devices, if you want to make 3-D models or battle zombies the right way, you’ll need dedicated hardware. 10 Cool Augmented-Reality Apps That You Might Actually UseGoogle Play and the App Store are awash with augmented-reality apps, and many of them are terrible. Here are ten that actually show AR’s potential. An Augmented-Reality App Could Mean Guilt-Free Screen Time With Your KidsWonderscope creates a 3D storybook right in front of your eyes — and could help you feel better about letting your kids spend time with a screen. The Magic Leap, the World’s Most-Hyped Gadget, Makes Its Underwhelming DebutThe Magic Leap is here, I guess. Report: Pokémon Go Caused Billions in DamageResearchers extrapolated how much playing while driving cost financially. Will Apple Debut an AR Headset by 2020?A report says Cupertino wants to get a headset to market within the next three years. Tim Cook’s Doesn’t See AR Glasses Happening Anytime SoonPer Cook, augmented reality will stay on your phone or tablet for a while yet. The Black Eyed Peas Take Us Inside Their Augmented-Reality Comic BookWith the help of an app, the art in the graphic novel bursts off the page. Apple’s Augmented Reality Is Gonna Be HugeApple’s augmented-reality efforts are already impressive — and will soon be available on hundreds of millions of phones. The Rebirth of Google Glass on the Factory FloorGoogle Glass is back, but you won’t be seeing it on the streets anytime soon. HoloLens Was Just the Beginning. Microsoft Wants to Own AR and VR.Working with Acer, Microsoft is putting out what will be the most affordable full-featured VR headset this holiday season. Facebook Thinks Augmented Reality Is Its Future. Sorry, Snapchat.If Snapchat wants to be the Apple of augmented reality, Facebook is more than happy to be its Microsoft. Are Apple and Zeiss Working on Augmented-Reality Glasses?One tech blogger claims that Apple and the high-end German optics company will release a pair of AR glasses — this year. Snapchat Signals Hardware Plans, Joins the Bluetooth SIGIt’s the closest thing yet to an official confirmation. 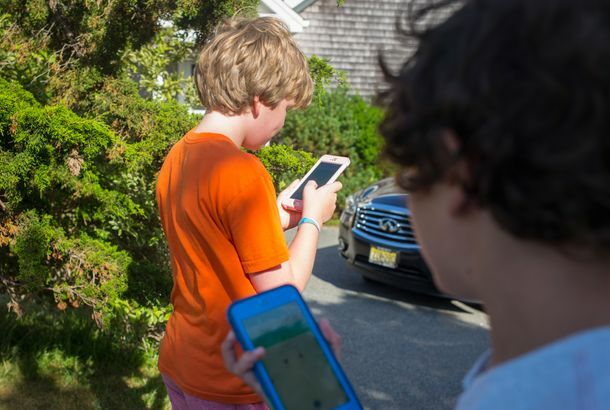 How Pokémon Go Might Actually Be Helping Kids With AutismIt isn’t some crazy, unsupported theory. Pokémon Is Back As an Augmented-Reality Game for People With Zero ShameBe prepared to do some awkward stuff in public if you wanna catch ‘em all. Google Just Invested Millions of Dollars in a Very Eccentric ManMeet Rony Abovitz. DKNY’s New Campaign Features ‘Real New Yorkers’And Rita Ora. Founder of Digital Eyeglasses Gets Les Specs Ripped Off at Paris“As this technology becomes mainstream, McDonald’s might need to get used to it,” he writes. Vulture Bytes: Ménage à Trois Headphones and Augmented RealityMiddle-school nostalgia by way of splitter headphones and 100-disc CD changers.